Diplomacy always involves delicate balancing acts, but seldom more so than for Algeria's ambassador to the United States, Madjid Bouguerra. As ever-larger crowds march through the streets of his homeland demanding an end to the rule of President Abdelaziz Bouteflika, the veteran diplomat — who has served in Washington since 2015 — finds himself trying to reconcile his role as the president's envoy with his feelings as a self-declared Algerian patriot. 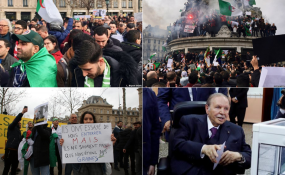 Huge crowds filled the streets of Algiers on Friday for a fourth consecutive week to demand Bouteflika's immediate resignation, despite his promise earlier in the week to drop plans to seek a fifth term in elections that had been scheduled for next month. While most outsiders have been surprised by the massive protests demanding the exit of establishment figures — known collectively in the country as "le pouvoir" ("the poweful") — longtime observers say the unrest has been brewing for more than a decade. Michaël Béchir Ayari, senior analyst with the International Crisis Group, told VOA the feeling that the Bouteflika government is out of step with the majority of the society is widely shared among Algerian citizens, ranging from the old guard who fought to end French colonial control in the early 1960s to the numerous youths who have taken to the streets. Until now, Ayari observed, individuals and groups hoping to replace Bouteflika have largely chosen to not give speeches or lead marches, out of concernthat they might be seen as hijacking a popular movement and alienating the protesters. “The only voice shouting was that of ordinary citizens,” he said.